Topiary art relies on a mutual relationship between you and your plant; the plants have been carefully sculpted to a frame and to maintain and even enhance the appearance of the sculpture some careful consideration and attention is required. 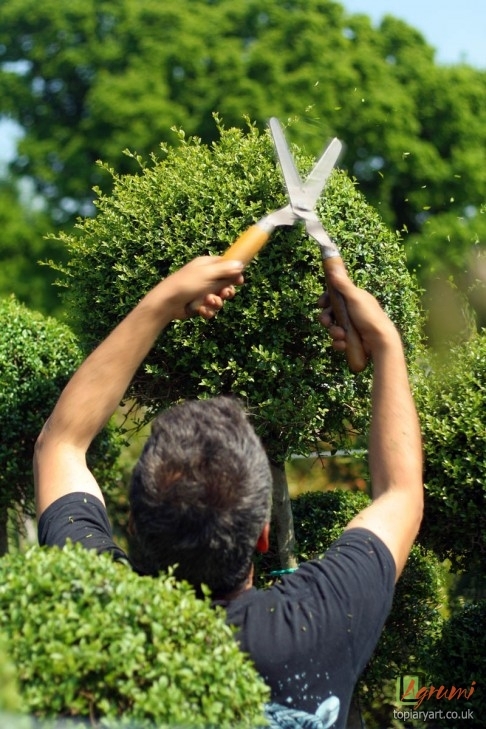 If you have purchased an artificial topiary product then, of course, no further maintenance is required; you can situate you topiary wherever is desired. Obviously you will wish to place your topiary where you can best appreciate it, but take a minute to make sure the plant is also getting the conditions that it requires. Ideally, place in deep, fertile, well-drained soil in a sheltered partially shaded site; Ligustrum is a very adaptable plant, and thrives in most situations except permanently water-logged soil – hence it is well suited for growing in containers – or extreme cold. During the summer or in hot/windy sites it is especially important to water your plant during the first two years to prevent them drying out. Watering should take place every day, preferably during the evening, and care should be taken to avoid wetting the leaves. If the pots are standing in trays make sure that they do not continually contain water as this may cause rotting of the roots. A mulch of ornamental gravel can help maintain water in the compost. When the sculpture is located outside during the non-growing season and, given sufficient rain, very little watering is required. Keep an eye on the moisture level in the pot, ensure good drainage, and only water if there is a shortage. Once the plants have become established after the first two years they will require far less watering. If your topiary is left in the pot feeding your plant is essential for healthy growth; the nutrition available from the compost is quickly depleted, therefore a fertilizer will be necessary. The most convenient method is to use slow release fertilizer granules as they can be applied infrequently, depending on their life span; products such as Osmacote are readily available. You may wish to give plants in the ground the same slow release fertilizer; however it may not be necessary. If your plant is suffering from a lack of nutrients, it will grow very slowly and the leaves will become coppery brown or develop cream/yellow tip. Ensure that proper growing conditions are restored and you can rejuvenate your plant in a few weeks. or a regular pair of scissors for this operation. If you’re looking to maintain the size and shape clipping every two to three weeks will be necessary during the growing season; once it stops in September it will no longer be necessary to trim until the next spring. Increasing the size of the plant can be achieved by simply leaving an inch or two of new growth when trimming; while maintaining the thick bushy appearance and shape of the plant. Topiary appreciate good air circulation; if you feel like the foliage becomes too thick it may be a good idea to thin out the growth, removing some of the longer branches, allowing more light and air into the body of the plant. Ligustrum grows relatively well in containers, however, like any plant, has a smaller root ball when potted and requires more watering and feeding than the same when planted in the ground. It is advisable to re-pot the plants into a larger container every 2 years. This provides the plant with new compost and prevents the roots becoming pot bound. Pot bound plants make it difficult for the plant to access water and nutrients as the original compost will have been replaced with roots and the nutrients depleted. If you cannot place your plant into a larger container, remove the plant and carefully remove some of the roots and soil from the root ball using a sharp knife and place back into the same pot. Mix the new compost with slow release fertilizer, it is preferable to use a loam based compost such as John Innes No 3; this will help rejuvenate your plant. Keeping your topiary sculptures in good, healthy, condition will help them withstand any pests and diseases. However it is always a good idea to watch out for insects; such as leaf burrowing or scale forming insects. If you catch them early in the spring time you may be able to eradicate them with physical methods, removing the affected branches, or alternatively use chemical sprays to remove them. Likewise leaf spots, honey fungus and wilt can cause problems; be vigilant, ensure proper growing conditions are maintained and act early to prevent problems increasing. Should the leaves of the sculpture become brown it’s likely that your plant isn’t receiving enough nutrients; a common problem with plants left in the pot if no new feed has been added and all the nutrients have been leached from the compost. Once the new fertilizer has been added the brown leaves should become green again within a few weeks. Should the problem persist, it may be necessary to unwind the branches that are affected from the frame and to remove them with secateurs. This may expose the metal framework, however, leave the vegetation close to this area to grow and once they can cover the area exposed reattach them to the frame, twisting them in as you are able. 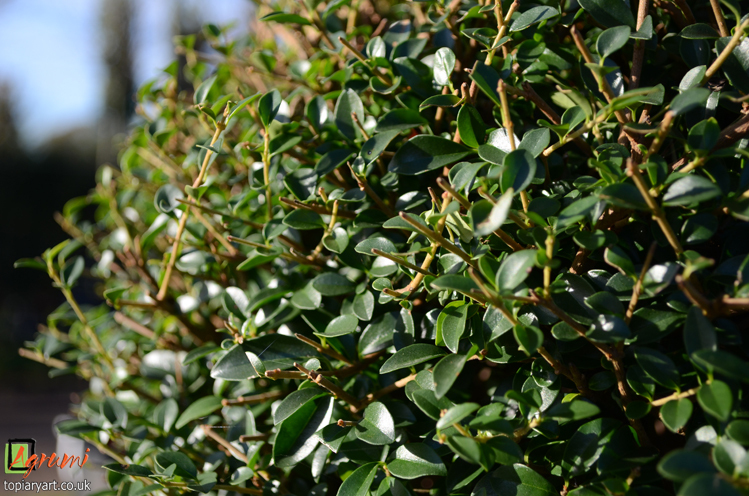 The quick growing nature of Ligustrum means that the full shape and beauty are promptly restored. We hope these instructions should help keep your sculpture in good condition and give you pleasure for many years to come.